These grain-free brownies are the REAL DEAL in terms of taste and texture. They are easy to prep and will deliver the chocolate taste you love! They are especially delightful with a dollop of whipped cream. Base (Almond Flour, Pecan Meal, Organic Golden Flaxseed Meal, Chickpea Flour, Organic Coconut Flour); Sweetener (Erythritol, Monk Fruit Extract), Undutched Cocoa Powder, Pink Himalayan Salt. 1) In a bowl, empty contents of package, add 2 eggs, 1/4 cup warm water, a teaspoon of vanilla, and stir well. 2) In a small bowl, microwave 2 tbsp butter, 2 tbsp coconut oil, and 1/4 cup of your favorite dark chocolate chips (not included) for 20 seconds. Stir until fully melted. 3) Pour butter mixture into the bowl containing the mix and stir until well-blended. 4) Pour contents into a lightly greased pan NO LARGER than 8in x 8in. 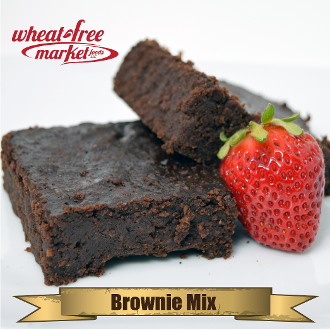 A smaller pan is preferable and will produce thicker brownies. 5) Bake for 20 minutes at 350 degrees F.
6) Allow to cool, then cut and serve!